Brandon is a member of Alpha Tau Omega at Pepperdine who leads a Chapter Ministry in his fraternity. Each week, over 10 brothers gather for Bible study, some encountering Jesus for the first time. Brandon is praying that at least 8 of his fraternity brothers come to Greek Conference and have a life-altering experience with Christ.­­­­­ But Brandon also shared that the biggest barrier to getting brothers to come to Greek Conference isn't time or lack of spiritual interest. He shared that the biggest barrier to brothers coming to GC is money. Cost is a prohibitive barrier preventing students from encountering Jesus. Will You Change a Life By Giving a Scholarship? Like Brandon, hundreds of Chapter Ministry leaders across the country are recruiting their friends and praying that cost will not be a barrier. The estimated cost of attending Greek Conference is $250. Last year, over 50% of all students who attended Greek Conference received a scholarship to attend. 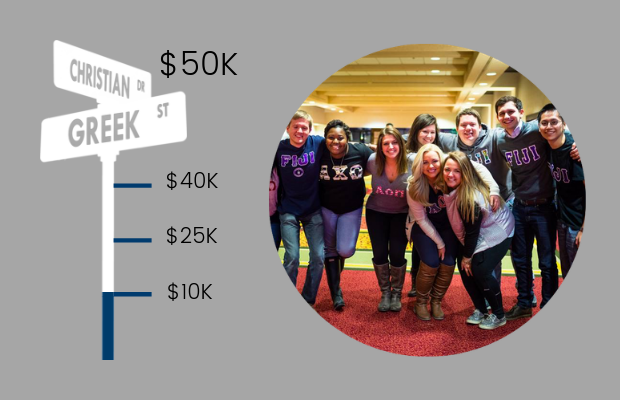 Our goal as the Greek InterVarsity National Leadership Team is to raise $50,000 for Greek Conference Scholarships. Would you consider sending a student to Greek Conference by giving a $250 scholarship? Would you consider helping to change a life this year?